Serrano peppers are a hot pepper that grow about 2 to 3 inches long. They start out green and turn red as they mature. Being sensitive to the cold, planting should be delayed until the danger of frost is past in the spring. Ideal temperatures are 70 to 80 degrees F during the day, and 60 to 70 degrees F at night. Usually, the plants set satisfactory crops when temperatures are between 65 and 80 degrees F and the soil is well-supplied with moisture. Avoid a soggy, water-logged soil condition when growing peppers. 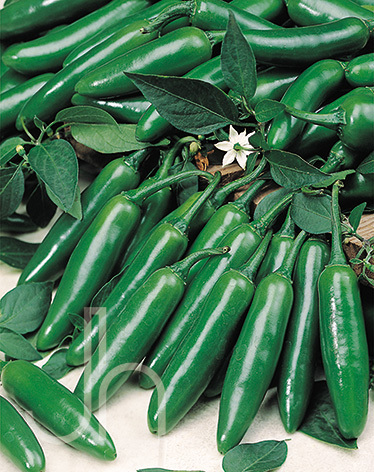 Outstanding Features: Serrano peppers are packed with vitamins and minerals. Tips: Choose peppers with deep colors and avoid ones that are wrinkled and soft. It is best to roast Serranos before adding to sauces. They will keep for a couple of weeks in a plastic bag in the refrigerator but will not keep their flavor after freezing. Water plants thoroughly after transplanting. Avoid planting under conditions that will stunt the plants and lead to poor production, such as cold weather, lack of sufficient soil moisture, or lack of sufficient fertilizer. Water deeply but not too often. Click here to buy Serrano Chili Peppers direct from www.buygardenvegetables.com.